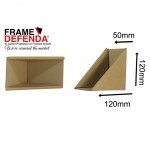 Avoid Damage To The Corners Of Those Beautiful Pictures You Are Selling With Our FRAME DEFENDA Corner Pieces. 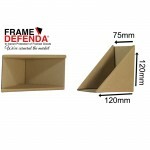 We All Know How Easily The Corners Of Pictures Or Frames Can Be Damaged Whilst In Transit. It Only Takes A Heavy Handed Courier Or Postman To Ruin What Should Have Been An Easy Transaction, Leaving You To Deal With An Upset Customer & To Rectify The Situation. 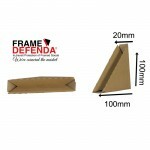 In addition to picture frames & mirrors, these environmentally friendly corner protectors, provide a simple and a very cost efficient method of protecting corners and eliminating damage to table tops, books, mounting boards, doors, double glazing units and many other products shipped as flat packs.